Wow I haven’t posted for a while! I have been very busy remodelling our new house which is where the Chinook hops were grown just this last summer. I have heard a few times not to use the first year hops but, “hey, why not?” About a month ago I brewed up a smash beer with help from a friend. We will call him the ‘Master Stirrer’. What is a smash beer you ask? SMASH stands for Single Mash and Single Hop. And that is exactly what I made, 12 pounds of Belgium Pale Malt and 4 ounces of Chinook whole hops from my back yard. Brew day went well with only a little spilled wert. This is the finished beer just before racking to the new sanke keg. Another friend borrowed me a keg and his Co2 bottle to give it a try. I filled up the keg and pressurized to 12 psi and let it sit in the garage for a few days. After three days or so I had to try it, I filled a glass about half full and held it up to the light. 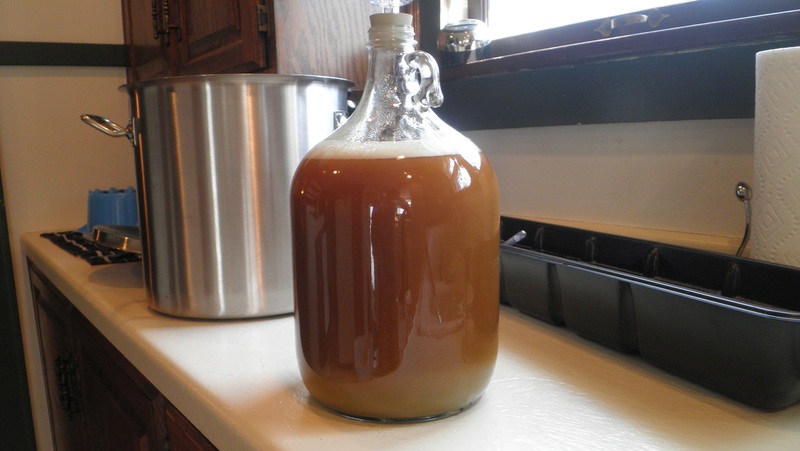 It was the clearest beer I have ever made! I’m not sure if it was the smash approach or the keg that made it so clear? The pale ale was not quite fully carbonated but it still tasted awesome. There was no corn sugar after taste like there is when bottling. I can’t wait to try this method again. Now I need to pick up a keg system! A few weeks ago I received a 52 quart Xtreme Coleman Cooler for my birthday. So I ordered stainless fittings and a valve from bargainfittings.com. All the parts arrived a few days later so off to Menards I went to get a few supplies. 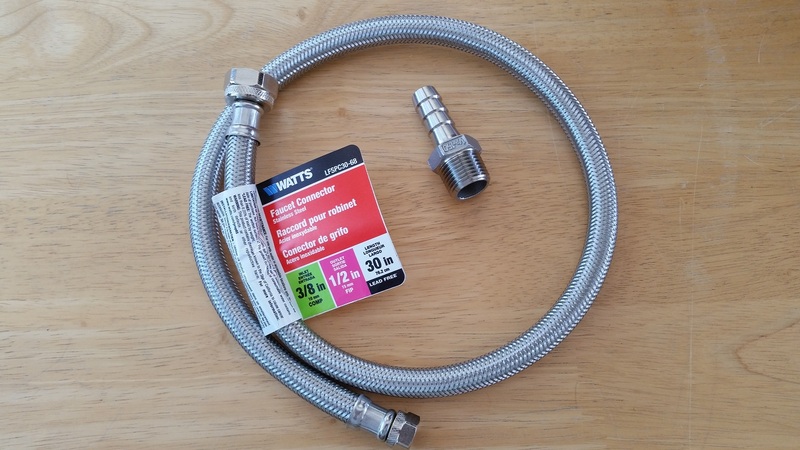 I bought a 30 inch stainless faucet hose, teflon tape, and a few small clamps. Looking at the picture that is the fitting I ordered from bargain fittings, I found it made the connection about 4 inches longer by the time the bulkhead was installed. I ordered another washer and a female barbed fitting. 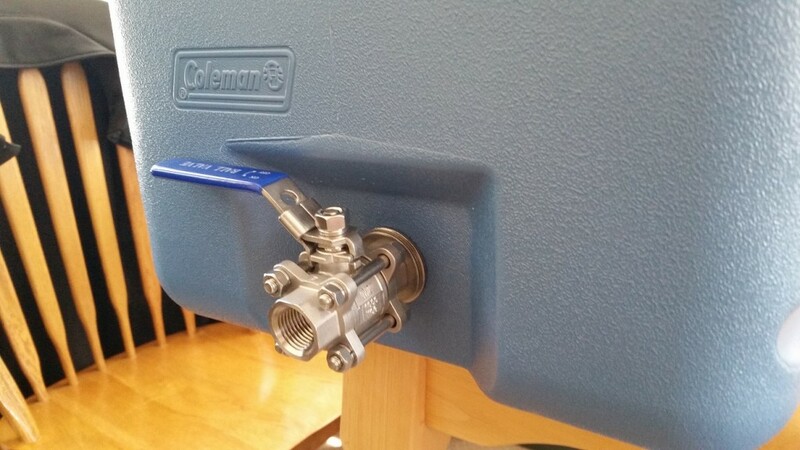 This way I can space the valve out a bit and connect the stainless hose/filter closer to the drain. I cut both ends from the hose with a hacksaw, I found it was much easier than I thought it would be. It only took a few strokes to cut each one off. 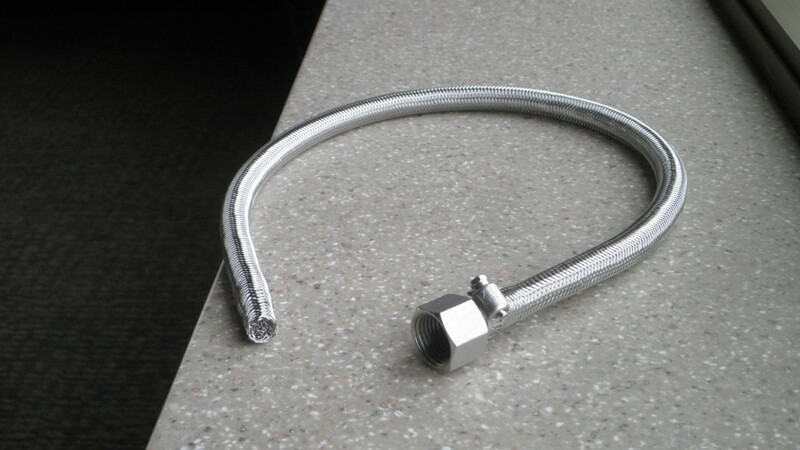 I have watched many YouTube videos before building my mash tun and I thought getting the stainless braid off from the hose would be really easy. Well it seemed stuck to the hose. I finally figured out that you have to push it back on to the hose a bit then it slides right off. Next using my needle nose piers I folded about 1/4 inch of brain back inside so no fray wires were sticking out. I added a small stainless clamp and slid it over the 1/2 inch stainless barbed fitting. Now what to do with the other end? I have seen many different ways to close it on YouTube. Should I put a stainless bolt in the end and clamp it? Should I put a plug in the end? Maybe I could just crimp it in my vise and fold it over? I saw a few people used a zip tie and just smashed the end closed. Well I decided to slowly fold about 1 inch of the brain back in to the end. I think it took about 4 times around before the end was solid, no clamp or zip tie needed. I’ll be making my first 5 gallon all grain batch in a few days. 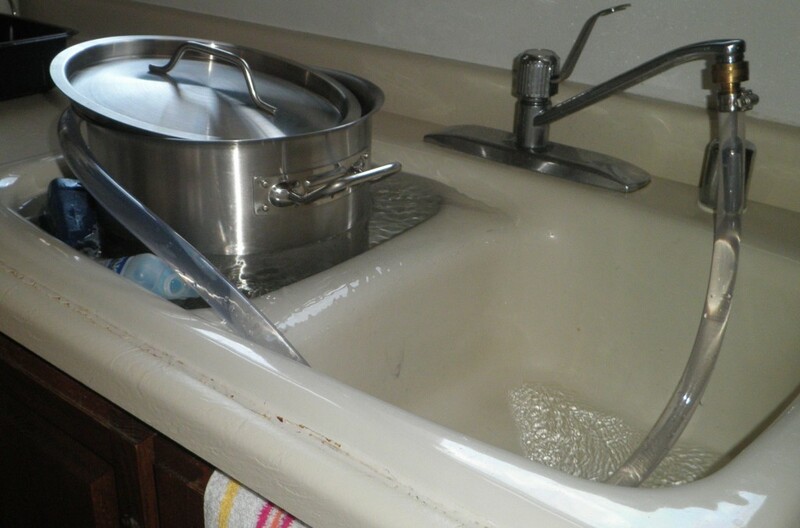 Can’t wait to try out my new mash tun. 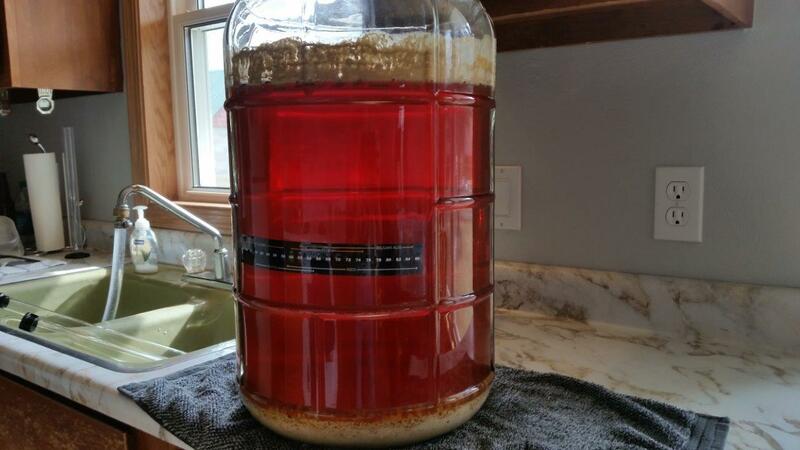 I plan to batch sparge the first time. 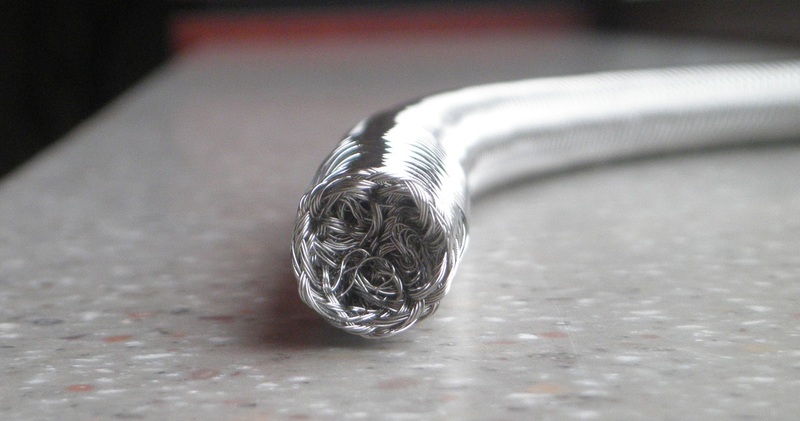 Does anyone have a better way to close the end of the stainless braid? I’m slowly getting into all-grain brewing 1 gallon at a time. 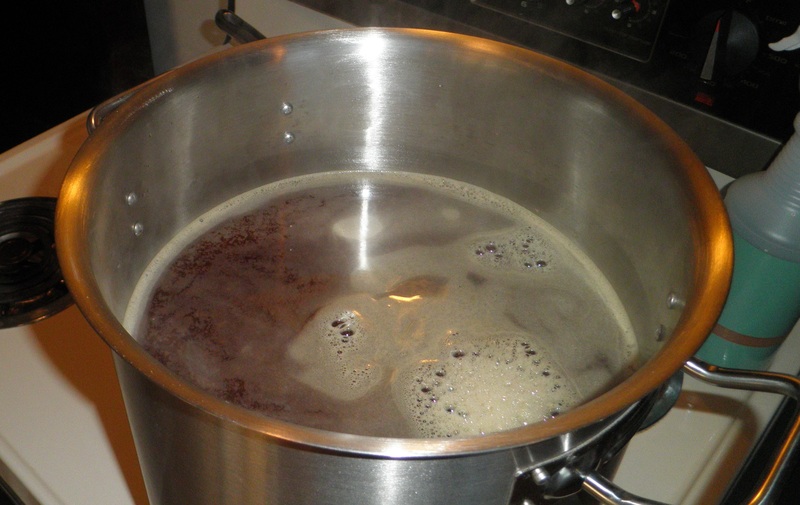 I brewed an all-grain pale ale using a 5 quart pot as a mash tun. I’m trying to learn a few flavor profiles before making the leap into all-grain. I used Briess Pale Malt and Caracrystal for this batch. I’m hoping the Caracrystal adds maltiness and an awesome orange color. I mashed these grains for 75 minutes and only lost 1 degree in an stainless pot. I thought I would need to heat the pot a few times and stir. On Briess’ website it says that Caracrystal only adds 55 lovibond. The grains looked much darker to me than that, we will see how this turns out. After the mash was complete I transferred the grains to my strainer above my 5 gallon kettle. I heated another gallon of water to 170 degrees and rinsed the grains until they ran fairly clear. I now have 2 gallons of wort in my kettle. I did a 60 minute boil using only Cascade hops. I used 1 ounce total for bittering, flavor, and flame out. 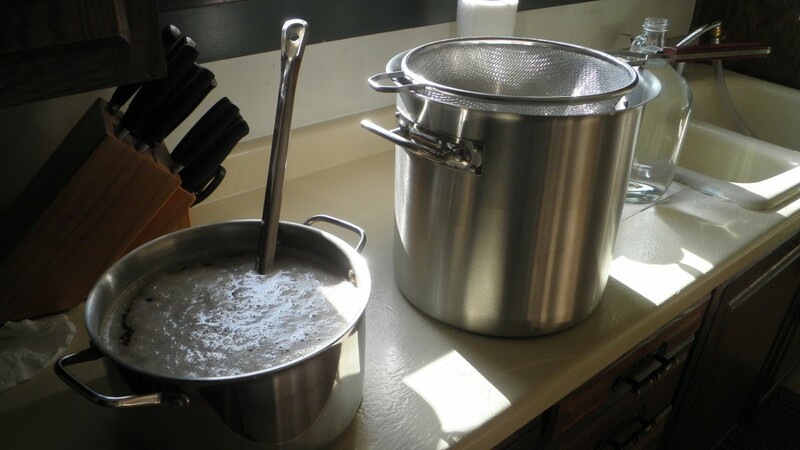 I was left with about 1.25 gallons of wort after the boil. After the wort was cooled to 69 degrees I strained it into my 1 gallon jug. I pitched 3 grams of re-hydrated Muntons Ale Yeast in 1/3 cup of water that cooled from 90 degrees down to room temperature. I next inserted an airlock and a few feet of 1/2″ ID hose for the blow off tube. There is no head space and this setup will be needed for sure. Exactly 6 hours later the Krausening formed and it rose in a matter of minutes. 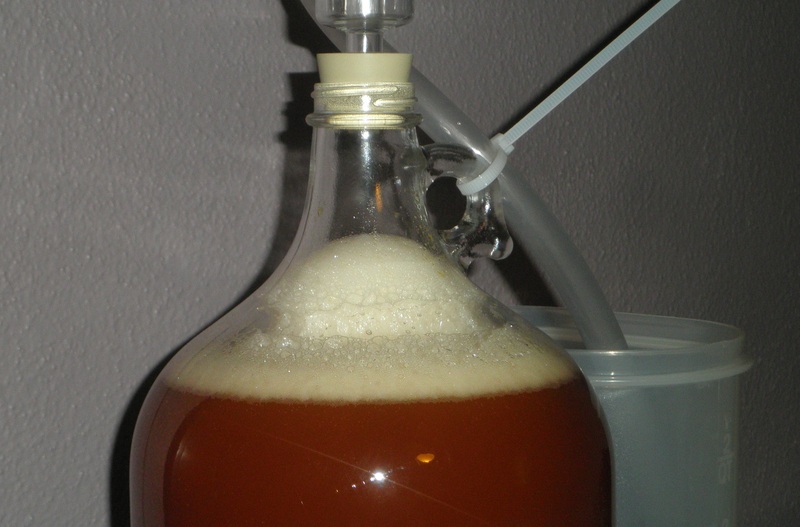 The pitcher sitting next to the fermenter went from silent to bubbling in seconds. Seems like 5 gallon batches don’t wake up this fast for me. This is another fun experiment that I have to wait 8 weeks to taste. I’m planning a 2-3 week fermentation then 1 week cold crashing. I may get 7 or 8 bottles and then three weeks sitting on top of my kitchen cabinets. It’s funny that this is the perfect place to bottle condition. The temperature stays around 73 degrees up there. Does anyone else make 1 gallon batches? It’s the same amount of work but it’s the only way I can make all-grain homebrew at the moment. Homemade whole grain barley bread, made from the spent grains left over from home-brewed beer. I use my bread machine to make the dough, you could follow this recipe and knead by hand also. Recipe makes 2 large loaves. Measure ingredients into bread machine in the order listed. Bake bread at 375 degrees, 35 to 45 minutes until knife comes out clean. Beer can be substituted for the water. Bread flour not all purpose flour. 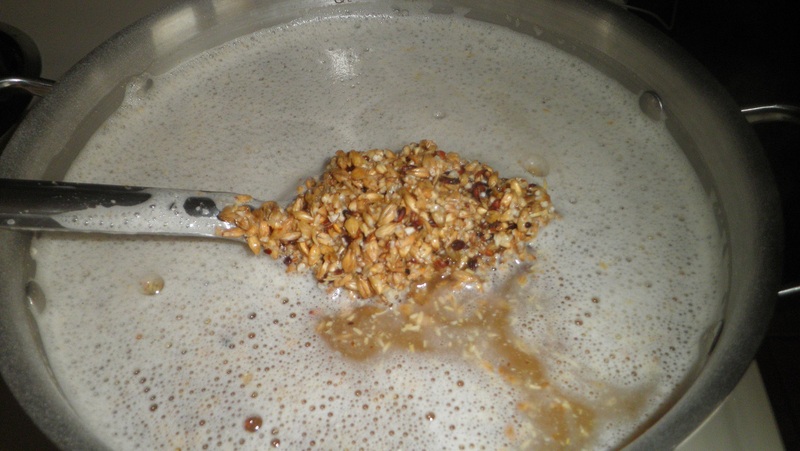 Use spent grains wet, straight from mash tun. 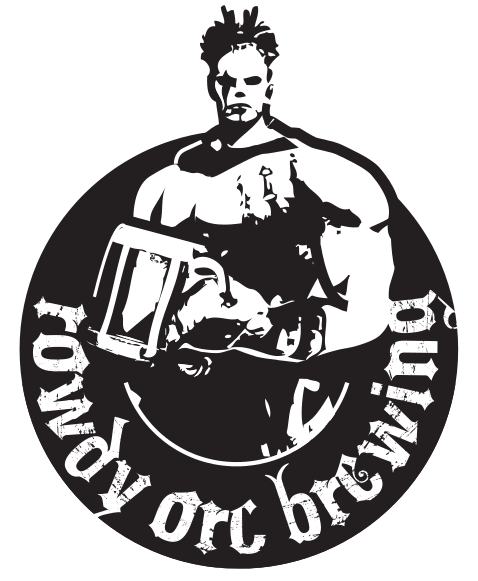 Saturday afternoon I bottled my Rowdy Orc APA . When I was transferring to the bottling bucket the hop smell was incredible. I used White Labs WLP001 California Yeast on this batch. The final gravity went all the way down to 1.010, the APV is 6.8%. This was much higher than expected, this is not a session beer. The bottles were all filled and sitting on the counter. I sanitized the capper and started with the first bottle I filled. All was going well and then I heard this sandy crunch noise. I looked at the bottle and glass was flaking off the side where the capper grabs to hold the bottle. With slight pressure the top of the bottle fell off. The next bottle did the same thing?! Did I just get some super-hero powers? No, I think I was pressing too hard on the bottle capper. The rest of them went well. This was the first time a bottle broke for me and hopefully the last. 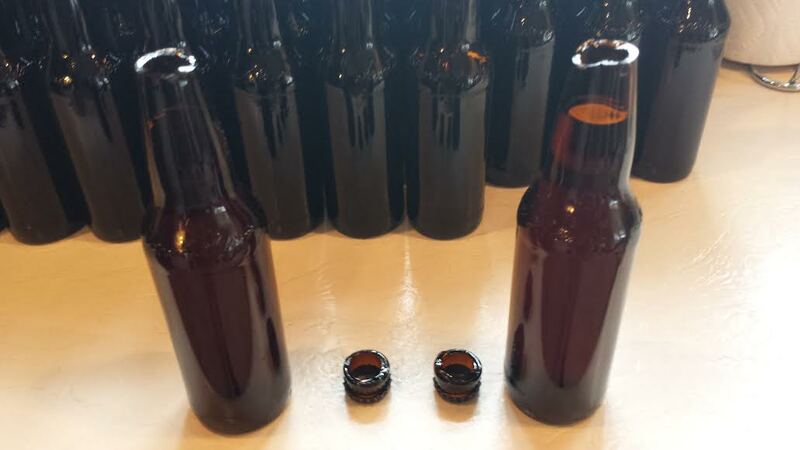 Now I just have to wait for three weeks while they all bottle condition. Cheers! When Chuck Norris drinks beer, the beer doesn’t get him drunk. The beer gets Chuck-Norrised. If you have 5 beers and Chuck Norris has 5 beers, Chuck Norris has more beer than you. Chuck Norris can open a bottle by looking at it. When Chuck Norris pours a bottle conditioned beer into a glass, the yeast stays in the bottle out of fear. The last time I used WordPress it didn’t have so many bells and whistles. It may take a while to learn all the new features and to make this site look the way I want. I’ll try to keep it simple and easy to navigate. If you have any tips or ideas drop me a note.